2019 Valentine’s Day Prize Package! LINNEAL HAULAN FROM TROUT RUN! OVER $500 PACKAGE OF LOVE AND IT’S ALL GOOD AND VALID THROUGH FEBRUARY 18TH, SO YOU CAN USE IT FOR THE WEEKEND! 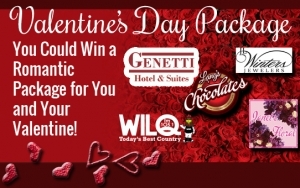 TO REGISTER, STARTING MONDAY, FEBRUARY 4TH, LISTEN FOR THE SOUND OF CUPID’S ARROW ON WILQ! WHEN YOU HEAR IT, CALL US! CALLERS 5 AND 9 WILL BE REGISTERED TO WIN WITH A DRAWING TO BE HELD TUESDAY, FEBRUARY 11TH AT NOON! YOU CAN REGISTER JUST ONCE AND MUST BE AT LEAST 21 TO DO SO! 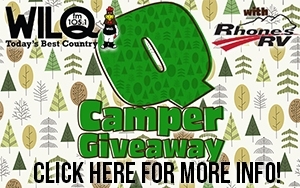 WIN BIG – Q CAMPER GIVEAWAY WITH RHONE’S RV! WILQ will keep you up to date on the latest closings, cancellations & delays across the Susquehanna Valley! Brought to you by Quality Collision. From craft fairs, fundraisers, church events, to blood drives and more, WILQ has the most complete list of events in the Susquehanna Valley. 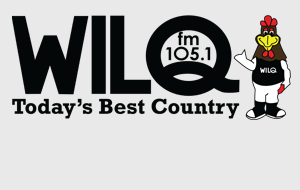 Copyright © 2019 WILQ-FM. All Rights Reserved.